Photo by Shinya Suzuki, CC BY-ND 2.0 Coney Island, though no longer truly an island, is and has been an iconic part of New York City culture since the early 1900's. The peninsular neighborhood is located on the Coney Island Channel in Brooklyn. It's home to more than 50 amusement rides and attractions, a boardwalk, an aquarium, several miles of beach, as well as MCU Park, the stadium where the Brooklyn Cyclones minor league baseball team plays. The year-long carnival like atmosphere is what put Coney Island on the map and today plenty of rides and attractions remain, many of which can be found within Luna Park and Deno's Wonder Wheel Amusement Park. Do not miss a ride on the wooden rollercoaster and Ferris wheel, both of which are New York City landmarks and listed on the National Register of Historic Places. Grabbing a bite at the world-renowned Nathan's Famous at Coney Island is another must-do. Photo by Jeffrey, CC BY-NC-ND 2.0 Rehoboth Beach may not be as famous as Atlantic City or Myrtle Beach, but this East Coast city's boardwalk can surely compete. The self-proclaimed "Nation's Summer Capital" is home to the Rehoboth Beach Boardwalk, a mile-long pedestrian promenade that dates back to 1873. Today, it still has all the classic boardwalk charm that you'd come to expect. It's lined with a variety of shops shaded by vibrant awnings, restaurants and vendors hawking saltwater taffy and popcorn, a bandstand, as well as an assortment of other attractions. Photo by Tomas Del Coro, CC BY-SA 2.0 Venice Beach, a seaside neighborhood in Los Angeles, is famous for a variety of things like its canals and Muscle Beach. Ocean Front Walk, the area's pedestrian-only boardwalk, is another defining attraction that draws visitors to the area. The 2.5-mile stretch is lively and colorful and lined with souvenir shops, restaurants and no shortage of eccentric offerings like street performers and fortune-tellers. Photo by Forsaken Fotos, CC BY 2.0 Maryland's Ocean City Boardwalk stretches for more than two miles along the Atlantic Coast of this popular seaside resort town. It's home to a plethora of attractions from hotels, shops and restaurants to the expected arcades and amusement park thrills. Whether you rent a bike, hop on the tram or walk it on foot, Ocean City's main attraction will keep you entertained with all the iconic boardwalk offerings from sunrise to sunset. Don't miss a spin on the vintage carousel, which dates back to when the boardwalk first opened in 1902. There's also a Ferris wheel and rollercoaster for those looking for more of a thrill. 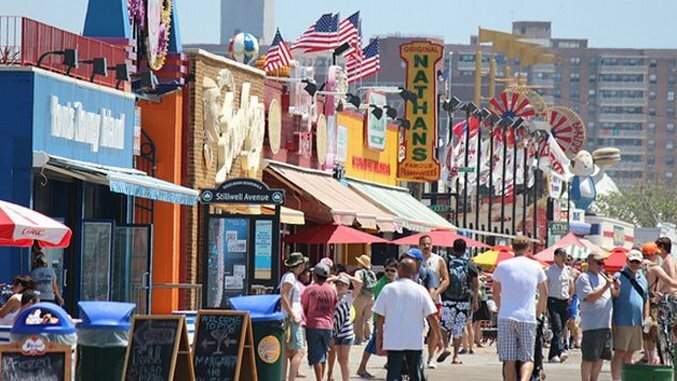 When you're ready to refuel or just looking for a treat, Ocean City Boardwalk is famous for its food. Options include fried chicken, pit beef, crab cakes, saltwater taffy, funnel cakes, cotton candy, frozen custard and a brewery. Summer is peak season at the boardwalk, when a calendar of concerts, movies and other activities are hosted along the beach. Photo by Fintrvlr, CC BY-NC 2.0 Few boardwalks are as famous as the one in Atlantic City, New Jersey. Claiming to be the world's first and longest, the Atlantic City Boardwalk dates back to 1870. It was the inspiration behind the original Monopoly board game and the book that the hit HBO series Boardwalk Empire was based on. Today, the boardwalk is home to hotels, casinos, arcades, amusement attractions and plenty of shops, restaurants and food vendors. There's also several museums like Ripley's Believe It or Not! and Atlantic City Historical Museum. Photo by Marada, CC BY-ND 2.0 South Carolina's Myrtle Beach is a favorite warm-weather destination with no shortage of reasons to visit and the Myrtle Beach Oceanfront Boardwalk and Promenade is one of its best. At just over a mile long, the boardwalk stretches from the Second Avenue Pier to the 14th Avenue Pier along the Atlantic Coast. It features three distinct sections offering something for everyone. There are quieter portions with raised wooden decks and abundant landscaping, as well as livelier sections with beachfront shops, sidewalk cafes, carnival-like arcade games and amusement park rides. Among the boardwalk's more noteworthy attractions are the SkyWheel, an observation wheel that was the first of its kind in the United States when it opened in 2011. Photo by Aaron Webb, CC BY-ND 2.0 The 25-foot-wide and 3-mile-long Virginia Beach Boardwalk along the Atlantic Coast has roots dating back to the opening of the then-famous Princess Anne Hotel in 1888. Today, it spans First Street to Fortieth and is lined with hotels, restaurants, attractions, museums and historic sites. It's also the site of the Virginia Legends Walk, which pays homage to Thomas Jefferson, Ella Fitzgerald, Edgar Allan Poe, Ella Fitzgerald and other famous Virginians. These seven pedestrian promenades are lined with arcades, amusement rides and vendors hawking treats like saltwater taffy and funnel cakes. They’re as much a staple of summer as the drive-in theater and traveling carnival. From Coney Island to Venice Beach, this week’s Bucket List brings you seven iconic U.S. boardwalks.